Thyroid hormones (TH) exert their actions by binding nuclear receptors alpha (TRα1) and beta (TRβ1 and TRβ2). Resistance to thyroid hormone (RTH) is a clinical syndrome with various clinical manifestations, its hallmark being decreased tissue sensitivity to the action of thyroid hormones. We report the case of a family harbouring a novel TRβ mutation. Sequencing of the TRβ gene revealed a single nucleotide substitution-C to G in codon 340: glutamine was replaced by glutamic acid. The clinical picture and biochemical and hormonal panel showed significant differences within the family, despite their sharing the same mutation. We also present the result of low-dose antithyroid treatment in one member of the family diagnosed with this rare condition. 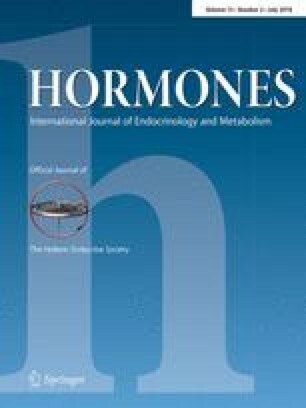 Dumitrescu AM, Refetoff S, 2015 Impaired Sensitivity to Thyroid Hormone: Defects of Transport, Metabolism and Action. Thyroid Manager (https://doi.org/thyroidmanager.org).